Since I have not read comic books for almost forty years, I am often unfamiliar with the back story and the multiple mythologies that grow up around those characters. The Marvel comic book movies of the last seven years or so, have gone a long way to bringing new audiences to those stories. The first "Iron Man" movie back in 2008, was one of the best films I saw that year, much less one of the greatest comic book movies ever made. Tony Stark was an original interpretation and Robert Downey Jr. was the right man for the job. Today, after several movies where he has played that part, I think it is safe to say that he is earning every dollar that he gets paid. The whole persona that Stark puts out in these movies is a reflection of the performance that RDJ gives. While the character of Iron Man/Tony Stark may continue after he leaves the part, his impact will hang over every future story that Marvel tries to tell. If you like Robert Downey Jr.s' snarky persona and witty one liners, then you should find plenty to enjoy in the third film that bears the name of the main character. This movie is all about giving Downey Jr. the chance to quip and pontificate and pose for the audience as the brilliant and self absorbed billionaire superhero. He trades throwdown insults with the villains, he plays modest megalomania with secondary characters, and he gets to pose heroically when the suit gets thrown on him. That said, there are a few things about the movie that are going to be problematic for fans of story telling. This film is all over the place, setting up confrontations that don't pan out and building a set of rules to operate under that are going to be ignored. It is overstuffed with visual gimmicks and there is a never-ending series of fight scenes that while great to look at, don't make much sense and do little to build any tension in the film. The motivations of the characters remain murky, that includes our hero, his sweetheart, and the multiple villainous characters that come along. The premise of the challenge that Iron Man faces here concerns a DNA regeneration process that might allow for the kinds of physical restorative powers shared by The Wolverine in that sister series of comic book heroes. At the same time, there is a mysterious terrorist with incredible reach who seems to be honing in on an ultimate act of terror that no American know how or strength will be able to respond to. It turns out that these two threads of storyline are connected in an interesting way, but it will probably escape anybody who is not paying close attention because neither of those plot lines gets any development except through action. I generally agree that movie stories should be shown and not told, but we are not shown enough in the events of the film to make the threat completely clear and what is explained is sketchy and fragmented and inconsistent. In "The Avengers" last year, our team of superheroes was faced by aliens with godlike powers and advanced technology. It's a comic book so we can swallow that. The powers that are faced down in this story are supposed to be based on human science and genetics, but they come off as a little outlandish. When the main enemy opens his mouth and becomes a creature out of "The Fellowship of the Ring", it is too hard to swallow. In the climactic battle sequences, the powers of those evil opponents seem to fluctuate so much that they might better have been mutants who developed separate strengths. It is never clear why some are defeated and others continue. The final battle between Iron Man and his nemisis is also inconsistent. One strategy works temporarily and then fails but when it is repeated a few minutes later it succeeds, without any explanation. There are some fun surprises along the way. The Mandarin character is underutilized, and there is a reveal that is clever but undermines the tension of the story. It does however help explain the weird accent and why Ben Kingsley is playing a character who is supposed to be from the orient. Guy Pearce starts off well but by the time the storylines are being played out, the originality of his character is lost and the most important part of any action film (the quality of the bad guy) gets lost in a series of action sequences and fights that are great to look at but make very little sense. I did enjoy the rescue stunt that involves Air Force One. There was a quieter scene when Tony is waiting for his technology to come to the rescue that works pretty well. One henchman voices the thoughts that all of us should wonder whenever there are hundreds of extras being killed in service of the plot. It was the most entertaining bit in the movie. It got a big laugh and it was one of the only times in the movie that someone other than Tony Stark was half way interesting. Unfortunately that moment lasts about five seconds and then it is back to the mayhem. The choices that Tony Stark makes and the technology that gets employed are both arbitrary. He is alone in Tennessee working with nearly nothing at one moment, and then has the command of three dozen robotic versions of Iron Man in another instance, without much reason why except that it helps make the final conflict bigger. 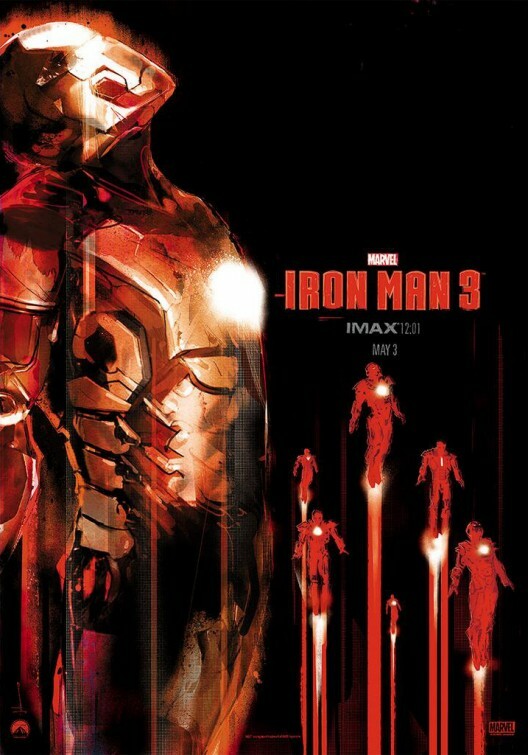 In the first "Iron Man", Stark is the hero and the story is about his rise to face adversity. The second and third editions are all about spectacle. They provide that but without the kind of emotional connection we got from the original story. If they are not careful, Tony Stark will turn into Jack Sparrow, a great character in need of a story that will wear out his welcome. "Iron Man 3" will play well for early summer, and it will live on video and broadcast quite happily. It is not as disjointed as the first sequel was, and it has a high level of entertainment value, but it does not have the drama that it needs to reach for greatness. The trailers for the film promised an uncompromising confrontation between a sinister and mysterious figure and our hero. What we got was even more conventional than that, and it was less satisfying as a result. "overstuffed with visual gimmicks and there is a never-ending series of fight scenes that while great to look at, don't make much sense and do little to build any tension in the film." Yyyyyyyyyyup! "The powers that are faced down in this story are supposed to be based on human science and genetics, but they come off as a little outlandish. When the main enemy opens his mouth and becomes a creature out of "The Fellowship of the Ring", it is too hard to swallow." Yyyyyyyyyyup! Anyways, good review, I think we see eye to eye on this one Richard! Yep, that's what I thought when I finally looked at your post. Thanks for being so correct that I look good by comparison.